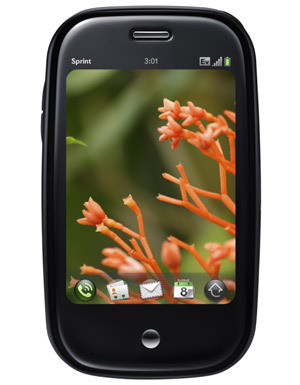 Full disclosure: I have had PALM smartphones since the Treo 500 through the Centro. Yes, I like them. No, this is not an un-biased review. My PALM Pre arrived from Sprint this morning. I didn't want to wait in line at the store and wasn't in a tremendous hurry to get one. Overall, I have a highly positive initial opinion of this device. My most recent phone was a Palm Centro so the touch interface presents some differences that I need to acclimate into my usage. I opened the box to the following contents: The Pre, corded stereo headphone headset, a standard to micro USB charging/data cable, a simple black and orange fabric protective sleeve, a 110v to USB adapter (PALM branded), instructions, and cell phone recycling bag. The packaging is well done and seems to be constructed of decent quality materials. I may keep the headset in my laptop bag for emergency usage. I applaud PALM for finally making a device with a "standard", in this case USB, data and power interface. The device setup was painless. I contacted Sprint to do the ESN swap. According to the CSR I first spoke with, there is only one department that does Pre activations. She quickly transfered my to the second CSR. There are account restrictions for this device, so contact the appropriate Sprint representative. I had to change my account to a full Everything plan to meet the needs I forsee. The actual setup consists of turning the device on, setting the language, and allowing the Pre to join up to Sprint's network. The second CSR I spoke with verified that I could tether the Pre, but warned me that the software for this functiion is "not fully developed". He also spoke with me regarding the backup / sync functionality. I've spent years in the Palm Hot Synch Manager world. The Pre handles things quite differently. In order to backup the information, users must create a PALM.com account. Backups are sent nightly to the user's Palm Profile. Backup options are limited to allowing the auto backup, disabling it, and "Back up now". The Pre itself is very easy to use. The new WebOS is fantastic. Being able to switch between different applications presents a significant advantage over what I've experienced with other smartphone platforms. I ran the Pandora application and switched to email. When the song changed, I was notified by the new song title and artist in a single line below the email application. Very nice and of considerable use. The gestures are a big change for me coming from a Palm OS 5 tap tap tap environment. However, they work easily, are clearly explained, and simply understandable. I've still reached for the stylus a couple of times. The slide-from-under keyboard feels sturdy and there are minimal keyboard changes from the Centro. Plus points for the dedicated @ symbol key. I'm not a fan of the location of the micro USB port. It's on the side and covered by a flimsy plastic door. This reminds me of the cover of the memory card slot on the Centro. And further reminds me that the Pre is without a memory expansion slot. So, I won't be using it as my primary music device. I've also noticed that heavy usage heats up the battery. I'm not entirely sold on the wireless charging, the primary impediment being the $70 cost. So, overall a very positive experience and I'm happy to see PALM come through with a very nice device and an excellent OS. This entry was posted in Uncategorized on June 10, 2009 by czmilosz.